Every June begins a new celebration because that’s when Ataulfos arrive at Harry & David for online shopping goodness. (H & D calls them Honey mangoes) This is a big deal BECAUSE Harry & David is the only fruit/gift basket vendor I know of that stocks Ataulfos for ordering online. So if you live in one of those areas where you can’t get Ataulfos, or you want to send them as a gift this is your chance. Don’t pass it up because they do sell out. Ataulfos are prized because they have a lot of flavor AND they have nice, smooth, fiberless flesh. 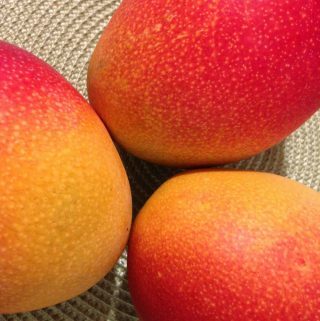 One thing to know about Ataulfos is that have a smaller seed – and are smaller in general than other mangoes, so I wouldn’t use a mango pitter on them. If you do, what will happen is there will be a good amount of flesh left on the seed (waste of pure mango goodness). If you’re feeling like you want to make someone’s day (or even your own) click here to see the options – prices start at $49. The coupon below will help out with Ataulfos (or any fruits you might want) that come in a 12 month fruit delivery option. Fruit Clubs – for When You Want Mangoes and a Whole Mess of Other Great Fruit Too! 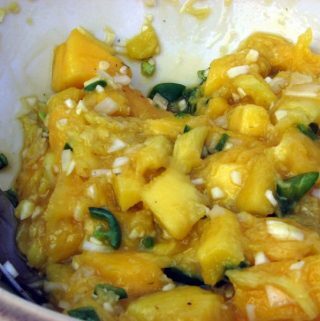 Previous Post: « Mango Recipe: Curried Mango Quinoa Salad – YES. YES. YES! !